MES Hybrid Document Systems Inc supplies and supports document scanning and management solutions in private and public organizations across Canada. Located in Markham, Ontario, the company offers a full range of document management services and products. Andrew D'Arcy is Chief Operating Officer. 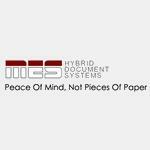 Products Carried: MES Hybrid Document Systems Inc offers comprehensive and custom tailored solutions to address their clients’ document scanning and document management needs. Located in Markham, Ontario, products and services offered by MES Hybrid Document Systems include: Document Scanning, Document Management Software, and Data Capture / Indexing. They also offer Document Scanners, Micrographics, and Hardware Support.